Signed/Numbered/Embossed, 13x19 inch, Archival Art Print. 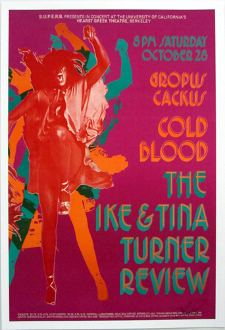 This Thomas Morris designed print was for the Ike and Tina Turner Review, at Berkeley, Oct 28th, 1971. An original poster was photographed and the image restored, corrected and embellished by Thomas Morris. Then, Thomas prints them using archival inks on Cold Press Bright paper. The results are outstanding! Thomas Morris designed and printed the original poster back in 1971. He now offers personally signed and embossed Art Prints from the same shows. (See attached photos). These prints are NEW – Mint – and ready to be framed. Prints ship ina tube and I gladly combine shipping costs. For other Thomas Morris (Carson-Morris Studios) prints, and posters, go to Blue Moon Posters. Thanks.